How do you imagine the coming alien invasion? Movies have been all over the map with this question, though in recent Japanese films such as Takashi Yamazaki’s “Parasyte” duology (2013-14) and Daihachi Yoshida’s “A Beautiful Star” (2017), extraterrestrial visitors take a human form. This is also true of the aliens in Kiyoshi Kurosawa’s cleverly metaphoric sci-fi “Before We Vanish,” which premiered in the Un Certain Regard section of this year’s Cannes Film Festival. They invade human hosts to prepare for an invasion that will wipe out the human race, save for a few specimens to be kept for study purposes. One twist is that we never see the aliens in their original form. Another is that the aliens are ignorant of what makes their hosts tick and try to remedy that situation by acquiring a human “guide” and taking what they call “gainen” (“concepts”) — deep-rooted beliefs about family, possessions, self, work and love — from unwitting humans with the touch of a finger to the forehead. The giver is left unharmed, save for the loss of said concept. This turns out to be a very big deal indeed. Telling a story based on Tomohiro Maekawa’s 2005 play, Kurosawa keeps the tone lightly, if pointedly, comic in the first half, save when violence erupts or passions explode. This may seem jarringly uncharacteristic to fans who know Kurosawa best for his ventures into horror, in which the prevailing mood is skin-crawling dread, but this combination of black comedy and action keeps the film from subsiding into dull whimsy. And as the tone turns serious in the second half, Kurosawa delivers his signature chills, along with moments of unexpectedly strong emotion. 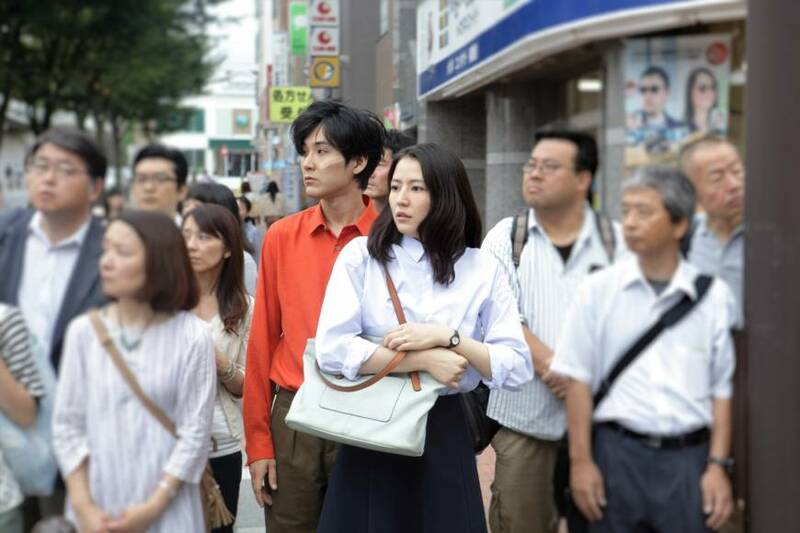 At the center of the film’s slowly gathering storm is Shinji Kase (Ryuhei Matsuda), a mild-mannered guy who has his extremely close encounter early on, much to the consternation of Narumi (Masami Nagasawa), his freelance illustrator wife. Faced with a muzzy-minded husband who has quit his job and bumbles about with a distracted air, she seethes with anger, while coming to realize that something is profoundly wrong. Meanwhile, Sakurai (Hiroki Hasegawa), a freelance journalist, is covering a murder investigation when he encounters Amano (Mahiro Takasugi), a young guy with a strange vibe who wants to meet Akira Tachibana (Yuri Tsunematsu), a teenage girl connected to the killings. They find Akira — and Sakurai learns that both Akira and Amano are aliens. He now has the biggest story of the century, but what to do with it? From this point the film enters a thriller groove, with a health ministry official (Takashi Sasano) and his minions mounting a violent offensive against what they dub the alien “virus.” Meanwhile, Amamo and Akira, with Sakurai an uneasy witness, begin building what they call a “communicator” to summon their alien comrades for the invasion. But to complete their plan they must connect to the third alien on the planet — Shinji. The film’s main contention, a fresh one for this well-trodden genre, is that minus a core of “concepts,” from a philosophy of work to feelings of love, it is impossible to be fully human. By appropriating them, the aliens approach the state of humanity, without ever quite reaching it. They are the Tin Man, Scarecrow and Lion before their fateful meeting with the Wizard of Oz. Society slips into chaos, but humans are also not, the aliens discover, so easy to defeat. The reason is pop-song simple, too much so for the cynical, perhaps.